Do you love taking friends, family or your pup out on the water for a paddle? 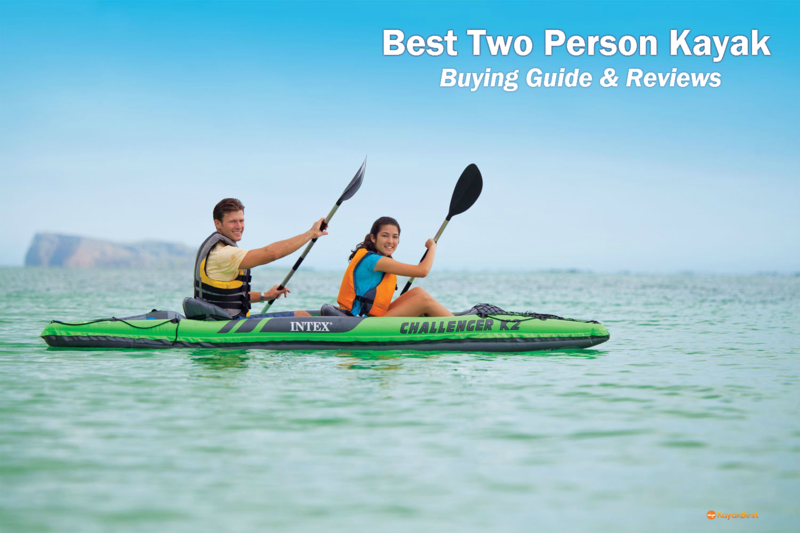 The best two-person kayaks offer double the fun! Tandem kayaks offer a range of benefits, including team building, less effort while paddling and excellent stability on the water. When you’re choosing which one to buy, it pays to take note of versatility. Most importantly, ask yourself where you most like to kayak and ensure your kayak comes with the appropriate requirements. Likewise, if you love fishing or camping, you’ll need ample storage space and weight capacity. Let’s take a look at some of the top choices on the market today. 3.6.0.1 If you’re looking for fantastic destinations, check out Hawaii Kayaking: Breathtaking Spots for a Paddle. This fishing kayak is incredible in the water. At 12.5 feet long with a 34-inch beam and 68 pounds of weight, it’s unlikely that a storm will knock this little boat over. Because of the beam, it glides through the water and offers great stability. Therefore, it’s a good choice for beginner kayakers. There are four comfortable carrying handles, which means ease of travel if you have to conquer a long distance to get to the water. In terms of storage, this kayak comes with two waterproof compartments, 7 fishing rod mounts and paddle rests. Additionally, there’s a cargo area with bungee cords to keep your gear secure. If you like to take multi-day camping trips, this kayak handles the load. Eight scupper holes ensure that water will quickly drain from the kayak, in the case of rougher weather. Due to its weight of 70 pounds, length of 13.5 feet, and a beam of 34 inches, this boat is definitely steady in the water. Waves are not going to tip it over easily, and neither will wind. The Sun Dolphin Bali is an excellent choice for oceans, lakes and rivers alike. 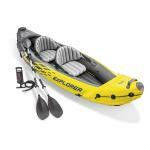 This kayak is another very versatile boat and accommodates 1, 2 or 3 people. Adjustable, padded seats with high backrests ensure comfort for long days on the water, along with adjustable foot braces. With one seat in the middle, solo kayaking is a breeze too. For storage, you’ll find three covered compartments and onboard shock cord deck rigging. There are also paddle holders so you can take a break and store them safely. To get the Sun Dolphin Bali to and from the water, carry handles offer ease and comfort. This kayak is very lightweight and also rather short, at only 10.25 feet. Though it may not be suited for taller kayakers, it is incredibly easy to paddle. The ease of paddling makes it excellent for beginner kayakers. To inflate or deflate this kayak, all users have to do is utilize the Boston valves found on either end of the boat. Boston valves allow air to be let in, but do not allow air to escape, which means if you struggle with pumping up inflatable items, this valve system is perfect for you! The pump for this boat is included with the purchase, as are the paddles needed. One of the best features of this boat is the repair kit that comes with it. If you are out on the lake and spring a leak, simply pull out the patch kit, which is US Coast Guard certified, and you’re ready to set sail again. The weight capacity on this boat is decent, coming in at 350 pounds to carry two people and some gear. It also has a removable skeg for directional stability. Perception Pescador is a sit-on-top kayak that’s easy to paddle on lakes or mild rivers. It fits two people comfortably. However, a center molded-in seat allows for solo paddling and also fits a small child or pet. For comfort, molded-in foot wells ensure kayakers of varying heights fit easily. A Comfort Seating System lets you paddle all day without feeling the strain. Bow and stern day hatches with protective lids keep your personal items safe and drink holders store your favorite beverage. To get this kayak to the water, Kayak Karrier Handles make the job easy for two people. Another great feature is a paddle park, to enjoy some time hands-free out on the water. Do you love to paddle all day or head off on weekend adventures? The Ocean Kayak Zest might be one of the best two-person kayaks for you. 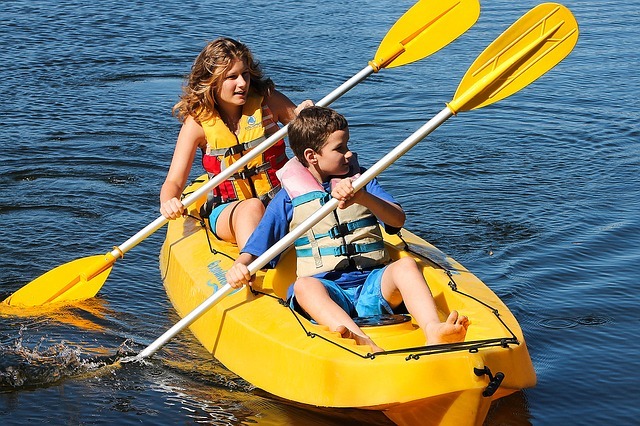 This kayak seats two adults comfortably and can also accommodate a small child or pet. For longer kayaking trips, the Zest Two features Comfort Plus seats with four-way adjustability. This means you can change the seats to fit your friends, family and children. You’ll want to take snacks and gear. This is easy with an oversized stern tank well including bungee straps, as well as a weight capacity of 600 pounds. While you’re paddling, you’ll also enjoy molded-in cup holders to easily quench your thirst. To transport the Zest Two to the water, there are bow and stern grab handles, plus side-mounted carry handles. Buying a two-person kayak comes down to individual preference, in terms of where you like to paddle and the kayaking experience of those who’ll be using it. However, factors such as maneuverability, transport, versatility, storage and weight capacity should be taken into account. It’s very important to know how your kayak handles in the water. For example, the heavier the boat, the easier it will be to handle. That being said, when your kayak is longer it could be more difficult to paddle. If you’re a beginner kayaker it’s probably best to get a heavy, but shorter, kayak. Do you plan on taking your kayak away on big adventures? Do you need to carry it quite a long way to launch on your local lake? Make sure you consider these factors before you make your purchase. Check for appropriate carry handles and whether or not the weight of the kayak is comfortable for you to carry. Where are you most likely to use your yak? For ocean touring? Or just on flat water lakes and rivers? If you want to use your kayak in the ocean, definitely opt for a longer, heavier kayak for greater stability. 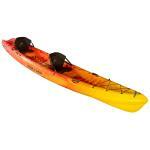 Most of these tandem kayaks have a beam of 34 inches and this is just about perfect for rougher waters. If you’re using your kayak in local lakes, a lighter, shorter kayak will do just fine. For tandem and solo trips, double check that the kayak you’re considering is equipped for both. The amount of gear you haul can make or break your kayaking adventure. For short hour-long kayaking trips all you might need is a drink, which all of these kayaks can handle. However, if you’re hoping to do day, overnight or fishing trips, you must double check that you have adequate storage. Be aware how much your kayak can carry, especially for a tandem kayak. When you have two people in a boat, you typically have a smaller weight limit for your gear. If you’re hoping to take a lot of supplies, ensure your kayak can carry all of it and not take on water. For some kayaks, a lower weight capacity may also mean tighter quarters. If you’re tall, double check that your kayak is of a recommended length for your height. At the end of the day, the best two-person kayaks are those that suit you best! It’s quite an investment, so choose carefully in order to enjoy many years paddling on the lakes, oceans and rivers you love best. If you’re looking for fantastic destinations, check out Hawaii Kayaking: Breathtaking Spots for a Paddle.